Everything was perfectly fine and then we woke up two days ago with luke warm hot water. We have hydronic oil-fired heat (beckett + burnham) and on-demand, tankless, oil-fired hot water (beckett burner, burnham boiler + burnham triangle tubes). I thought it might have been the mixing valve at the boiler. Cleaned that out. Mixing valve was actually pretty clean but there is a decent amount of mineral buildup inside the pipes. Not enough to restrict water flow. The heat works fine. What we are doing right now to make showers bearable is crank the heat tstat. When the beckett burner is burning, the water goes from warm-ish to just warm enough to be bearable to put your head under the water in the shower. My guess is that since mixing valve is fine and hydronic baseboard heat is fine (we are not out of oil, burner was just serviced, working fine etc.) and I didn't touch anything (no changes to system)... and that this is a sudden change, it's probably a thermocouple or temp gauge somewhere (or maybe relay in Honeywell controller). Something inside the boiler isn't telling the controller that the domestic hot water isn't hot enough therefore light the fire. Or, the temp sensor may be working fine but the relay (or whatever it is) inside the Honeywell isn't lighting the fire. I do the annual services on the boiler myself. I own a soot saw, ash vac and a bacharch draft gauge. I clean, change out the filters, check draft, look at the fire, inspect the fire chamber insulation, etc. I've never touched the domestic water side of the system... probably out of ignorance... I just figured if it ain't broke... I know there's a little bit of mineral scaling and buildup (we have a whole-home water filtration system sitting in the box waiting for me to install... it's "on the list"). Other than that I'm at a bit of a loss. It seems/feels electronical somehow. A temp sensor or a switch --because when we trick the system into turning on the fire (crank in-home heating tstat) the domestic hot water is just slightly cooler than what it was at a few days ago. If it matters, I believe that the Honeywell is set to 180, 160 and 15 diff. I have not touched those settings in 5+ years. I would use clamp on K-Type Temperature probes and check the incoming and out going (mixed) temperatures thru the coil. Could be the coil is plugging up (boiler side), could be mixing valve is bad-they fail toward cold. Could also be sensor in well damaged or not reading correctly. When it gets very cold, this call comes in. 40° water going into the coil lowers the output. You may also have a problem with 180/160/15. You can turn the dial on the low limit without a call for heat and see at about what temperature the boiler will try to maintain. If it comes on at 160° and the verified temperature on the boiler gauge isn't close, then it is probably with the aquastat and/or how it senses temperature. Your temporary remedy reminds me of an old school tech telling the customer, "Turn the hot water on until you hear the boiler fire. Shut off water, wait 5 minutes..."
Another option is a control strategy that gives domestic hot water priority and holds off the circulator. But if this is a new problem, I'd check the coil temperatures, and the aquastat first. Thanks Steve. At first I thought it was the mixing valve at the boiler. It wasn't terrible but it did have a little mineral deposits. One thing I noticed when I cleaned it out was that the mixing valve (at boiler) was set to full hot. That seemed a little weird to me. I typed that out for somewhat of a sanity check. I re-piped the heating system a few years back and that's fine --well... It saved us a ton of money on the oil bill, the heat is better, rooms are now more evenly heated and the return temps are now high enough that the chimney is no longer getting destroyed... But I've never once adjusted the temps in the control unit. So I'm wondering if I need to start over with a new baseline or bump my temps up a bit. Boiler is running fine (burner, combustion) but wondering if I should raise the temps so domestic water is a little hotter so I can actually use the mixing valve to mix. 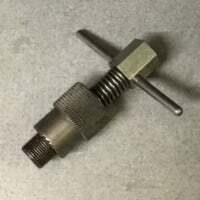 Get a clamp on thermometer for the domestic hot at the mixing valve. Without the heat running and the aquastat set to 170°- 150° with a 10° diff, adjust the mix to 120° or less. Unfortunately a tankless coil is a tankless coil. It could be scaled inside and out. Do your circulators shut off when the boiler temp drops to the lo setting? Thanks. I don't know about the circ pumps. When the tstat calls for heat, I know the circ pump turns on first then usually fire follows. Not sure if circ pump turns back off while fire is on. How is best to check this? My guess is no, circ pump is independent of boiler/fire. When tstat calls for heat it turns on the circ pump. Again guess: there is a second tstat/thermometer relay such that if water temps are too low in boiler, that tells fire to turn on. Turn your tub spout on full hot and go down to your boiler. if your Hot pipe coming out of your coil into your mixing valve and your "hot" pipe coming from your mixing valve going to your fixture are basically the same temp then you likely have a problem with scale in your coil creating poor heat transfer. If you have very hot water coming out of the boiler and cooler water going to your fixtures then you know your hot water is being mixed to cold and your mixing valve needs to be adjusted or replaced. My guess is that your coil has been becoming scaled for some time and as a fix the mixing valve was just adjusted a little warmer to compensate. Some mixing valves are able to be further adjusted by removing the handle and advancing it past the stop. Thanks Jellis, HVACNUT and STEVEusaPA. I've done a bit of Googling and have a few questions. I thought a replacement coil was expensive however learning that they are closer to $250-$300, I unscrewed the pipe outlet thread from the coil and yes, you were all correct, there is a bunch of scaling inside the coils. #2: Torque and install/uninstall: Obviously the boiler needs to be drained and it can't be scalding hot; does it matter if I unbolt the coil hot, warm, cold, etc.? How about re-install? Should I buy new fasteners? Will new unit come with new fasteners? If I buy new, should I get anything special (like Grade 8 so they don't snap off in the casting)? Should I use anything like a threadlocker on the fasteners? (Locktite blue/red) I found a YouTube video of a guy doing this swap and he used high temp automotive gasket sealer. Is that kosher or just follow the manufacturer's instructions? #4: Anything else I need to know? Any other "while I'm in there" type things I should do? Thanks again for the help. Happy Holidays! #2 They usually include proper gasket and bolts. It's easier if the plate isn't piping hot. Scrape off old gasket, clean with wire brush, wipe. Measure inside distance in the boiler, carefully stretch coil to almost that distance before installing. Installing is way easier than removing. I'd spray the bolts/nuts a couple times with penetrating fluid. Box wrench and a whack with a hammer. If you break a bolt it's drill/tap time. There's always a torque setting, but I wouldn't know it. Just snug plus a little more. It will heat up and expand, and you have a gasket. Of course re-fill the boiler before soldering the domestic pipes, in case of leak. I wouldn't use any sealant. Your original didn't have it, right? #3 Don't know enough to comment. #4 I can't find the diagram, but make sure you follow the code for your area. Some require a relief valve on the domestic. I did see a diagram (I think fuel oil news), where they had 2 webstone valves on cold and hot, and could isolate the coil for flushing. I'll see if I can find it. #1 nope coils are not the same you will need to tell a supply house model and serial number of your boiler as well as the shape of the plate and bolt pattern would be helpful. They may not sell one to you if you are not a licensed technician. #3 have your water tested for everything, likely you have hard water causing scaling in your coil, the only way to avoid this would be a water softening system. You can have your new coil piped with isolation valves and drains so that you may back flush your coil easily, you can use de-scaling products to clean the coil this way also. But like i said have it tested and get a recommendation from a some pro's. a water test is inexpensive when compared to replacing components in your home. #4 consider a indirect storage tank and instead of the coil, fresh water will not be flowing through the heating coil but boiler water with less oxygen content will be, this should reduce scaling in the coil and eliminate that problem and the scale will settle in the bottom of your tank, the tank is less likely to fail due to scale building and will take much longer.